Vector tiles are served in binary format which uses protocol buffers as the method of serializing structured data. The following diagram shows dependencies between the properties of vector tile. Represents a vector tile as a whole entity. It consists of TileLayers. As a part of Tile, this represents one of the layers that can be later rendered e.g., a layer which consists of all Parks, Roads, Build up areas, and Points of interest. This is basically geometry stored as an array which defines how a feature looks. It also contains labels for roads or POIs. A string, integer, floating point number, or boolean value. 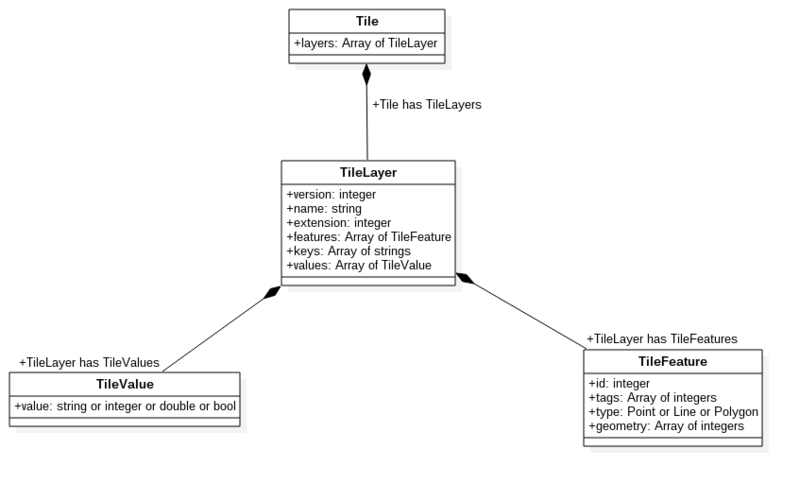 Keys of TileLayer and tags of TileFeature create relations between TileValue and TileFeature which includes specified TileValue (e.g., road label - TileValue - attached to road geometry - TileFeature). Formally, the structure of vector tile is described by the protocol buffer schema. It allows the generation of C++, Java, Python, Go, Ruby, Objective-C and C# code based on proto file. The Proto file used by TomTom is compatibile with the one used by Mapbox.